It always seems to be around the holidays that my mind wanders to a particularly perplexing question – perplexing, at least, to someone who has dedicated a significant portion of his life to studying and joining the political process: That is, to what extent, in the grand scheme of things, does politics actually matter? Those of us who breathe – or oftentimes regurgitate – political philosophy can certainly think that talk of public goods theory and the federal government’s fiscal role in our macroeconomic landscape, of the inerrancy of natural rights and the characteristics of federalism, is important; and perhaps, in an indubitable sense, it is. But then I run into a piece of artwork as uplifting as The Sound of Music or as poignant as The Catcher in the Rye, and I remember that the hills are not, in fact, alive with the sound of political discourse – nor is it legitimate to place oneself in Holden Caulfield’s shoes by imagining what it’d be like to catch absentminded politicians as they fall from cliffs. Indeed, there is a reason that the hills are alive with the sound of music, that Holden envisions “these little kids playing some game in this big field of rye and all” – and it all has to do with reasoning that is far more important and fundamental than politics; it all leads me to believe that, when compared with something as treasurable as art, politics is ultimately frivolous. The conclusion is preachy, but nonetheless basic and critical: As conservatives, we must see politics merely as the protection of things that are vastly more worthy of our attention and important to our lives as individuals, rather than as a subject of unfettered fixation. Oh you men who think or say that I am malevolent, stubborn, or misanthropic, how greatly do you wrong me. You do not know the secret cause which makes me seem that way to you … think that for six years now I have been hopelessly afflicted, made worse by senseless physicians, from year to year deceived with hopes of improvement, finally compelled to face the prospect of a lasting malady … I was soon compelled to withdraw to myself, to live alone. If at times I tried to forget all this, oh how harshly was I flung back by the doubly sad experience of my bad hearing … I must live almost alone, like one who has been banished … Such incidents drove me almost to despair; a little more of that and I would have ended my life – it was only my art that held me back. It was only my art that held me back – I cannot imagine a more endearing or earnest view of the purposes of art, which so captivates the psyche that even the saddest person who is sufficiently in touch with it can survive past torment, devastation, and utter loss. The realization seems to me to be an obvious one: Politics does not operate on the same spiritual level of existence as does art, such that its involvement can alleviate the qualms of life to the same extent as can a trip to the symphony, quiet time with a great piece of literature, or AMC’s latest miniseries. We would all do well, I think, to keep that in mind. It is true, anyway, that the words of the Heiligenstadt Testament reveal Beethoven as a man who was not only temperamental in his interactions with people (perhaps as a result of his personality and his father’s draconian treatment of him during childhood), but who was also sufficiently depressed at his bad health and hearing loss – he was, after all, a musical prodigy – that he was tempted to take his own life. One can only shudder at the implications: The loss of some of the most precious music in our collective repertory, as well as the diminished effect on scores of great composers in the nineteenth century and beyond who looked to Beethoven as a hallmark of something powerful in music-making. According to the composer, himself, it was his art that kept him motivated through all the emotional instability of that fragile time in his life. Indeed, only two years following his writing of the Heiligenstadt Testament, Beethoven created a symphony (his third) that both fulfilled and upset the presiding classical traditions of Viennese music – that has the ability to beat you into submission with its tragedy and uplift you into awe with its heroism – even while his musical aptitude faced a rather sizable obstacle in partial deafness. 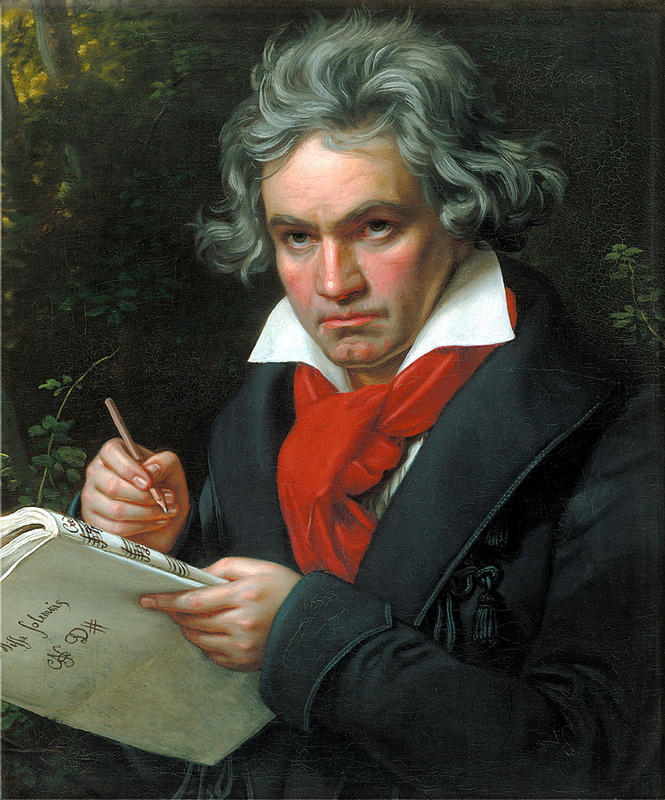 When you listen, in particular, to the funerary second movement – considering all of Beethoven’s struggles and frustrations, his moments of defeat and of exceeding triumph – it would be impossible not to marvel not only at the skill and power of his composing, but also at the extent to which he used music to understand and transmit to sound human crisis. If anything, Beethoven’s third symphony comes across as a complete representation of the power of art and of the beauty inherent to its process of distracting us from the trivialities of everyday life: When, in listening, you reach the heroic and confident final movement, you have utterly forgotten about politics (or else you were not listening properly) and you have been reminded of the substance that truly matters – it has nothing to do with the things that only count inasmuch as they buttress the experience of higher goods. Beethoven’s suicidal tendencies were tragic, but if they, in conjunction with his hearing loss, helped yield music like the third, fifth, seventh, and ninth symphonies, the whole musical world is behooved to say a prayer of thanks. As a major biographical harbinger of the composer’s struggle, the Heiligenstadt Testament seems to serve the critical purpose of focusing its readers’ attentions away from the petty, in favor of the existential and the poignant; for conservatives, it ought to remind us that we sometimes see politics in a way that is actually contrary to what we believe to be the role of political operation in the first place. After all, rampant political activity can turn even the most libertarian among us into creatures obsessed with using the instrument of government to fill the voids in our lives that Beethoven’s music or Shakespeare’s poetry or Newton’s theorems would normally fulfill. All in all, art is an amusing thing: There is some that acts primarily as a sort of social commentary or political calculus, meant to challenge or critique conventional thought – that affects the way in which one considers the everyday, practical problems of life. And then there is the art that manages to cast aside the often inane issues of politics in order to uncover that which is primal and blisteringly human – the sort that can uplift you to experiential sublimity and resonance or crush you into a deep and overwhelming sadness, such that you cannot help but forget the pettiness of all of society’s otiose quibbles. The whole point is that we all should ask for as much as possible of the latter: I cannot help but question the sanity of anyone who listens to the second movement of Beethoven’s seventh symphony – who momentarily pictures Cormac McCarthy’s wasted landscape in The Road – and does not drop whatever it is that he is doing in order to experience such profound meditation upon the nature of the human condition. Likewise, the conservative who bypasses The Great Gatsby for Mitt Romney’s latest expose on American exceptionalism is in need of serious self-consideration. Author’s Disclaimer: If you were to replace every reference to art in this article with a reference to Christian teaching, the article’s underlying premise would be even truer. Although I often forget, Christianity is to art as art is to politics – without the unifying narrative that the Bible teaches, or the idea that God inspires intellectual and artistic pursuits of all sorts as a way of glorifying and learning about Him, art, like life in general, loses most of its resonance, purpose, and power.